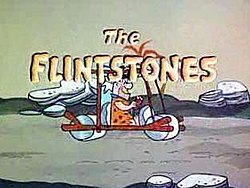 The Flintstones is an animated American television sitcom that ran from September 30, 1960 to April 1, 1966 on ABC. Produced by Hanna-Barbera Productions, The Flintstones is about a working class Stone Age man's life with his family and his next door neighbor and best friend. It has since been re-released on both DVD and VHS. Critics and fans alike agree that the show was an animated imitation of The Honeymooners with rock puns thrown in. William Hanna admitted that "At that time "The Honeymooners" was the most popular show on the air, and for my bill, it was the funniest show on the air. The characters, I thought, were terrific. Now, that influenced greatly what we did with "The Flintstones"...."The Honeymooners" was there, and we used that as a kind of basis for the concept." However Joseph Barbera disavowed these claims in a separate interview, stating that "I don't remember mentioning "The Honeymooners" when I sold the show, but if people want to compare "The Flintstones" to "The Honeymooners," then great. It's a total compliment. "The Honeymooners" was one of the greatest shows ever written. Its popularity rested heavily on its juxtaposition of modern-day concerns in the Stone Age setting.